Another plus for commuters as a new station is about to open on the METRORail Red Line. METRO Board members, staff, and special guests, including representatives of the Downtown Management District, will be on hand at METRORail’s Downtown Construction office, 712 Main Street, at 6:30 a.m., Wednesday, Feb. 18. Shortly after their arrival a ribbon-cutting ceremony will take place on the Central Station Main platform signaling the beginning of passenger service at that station. 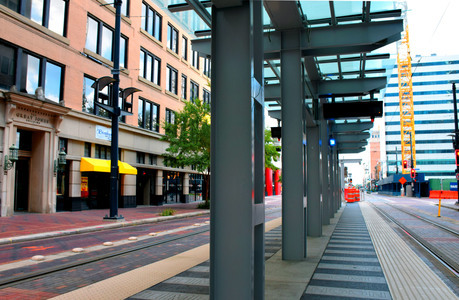 The station, located in the 700 block of Main between Rusk and Capitol, will also become a transfer point when the new East End/Green and Southeast/Purple Lines open in April. (Top) METRORail passengers will have a new station from which to access transit service beginning Wednesday, Feb. 18. The station will provide a transfer point for riders from the soon-to-open East End/Green and Southeast/Purple Lines. 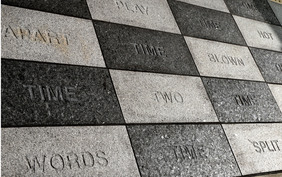 (L) Central Station Main features works from artist John Runnels whose paving stones showcase time. Using language as art Runnels seeks to establish a positive transit experience by creating a "psychological space" where time is optimized. Editor’s note: Please contact the METRO Press Office at 713-739-4040 if you plan to cover this event.